Another of those wonderful rumours proves to be true as Ben Nichols at Marina Marbella confirms that his joint listing with Benetti, the 34.95m motor yacht Johanna, is now sold with Benetti acting for both buyer and seller. ABS classed, Johanna was delivered by Benetti in 2003. This GRP hulled, Benetti Classic 115 superyacht was designed by Stefano Righini and Francois Zuretti and features the classic wooden panelled interior typical of the yard. 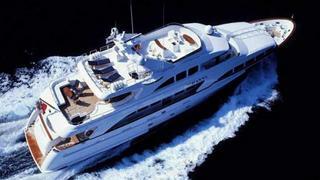 She can accommodate 10 guests in one master, two double VIPs, and two twin cabins. Power is provided by two 1480hp MTU diesel engines offering a range of 3,200 nautical miles at a cruising speed of 11 knots. Johanna has a maximum speed of 17.5 knots and was asking €6.8 million.